One of the few times WSU running back Jamal Morrow was seen vertically in Saturday's Apple Cup. Regular Inlander readers might know that I picked the Cougs to beat the Huskies in Seattle on Saturday. Um, ya, that didn't happen. Instead of a thrilling showdown between two rivals, viewers were "treated" to another beatdown, this one ending up 41-14 in favor of UW, and the score actually makes the game seem closer than it really was. WSU senior star quarterback Luke Falk threw three interceptions, the Cougs' leading rusher Jamal Morrow gained all of 11 yards on the day, and defense's leader Hercules Mata'afa got ejected from the game before halftime. Maybe he was as sick of watching the proceedings as viewers at home were by then, thanks to the 24-0 halftime score and the utter one-sidedness of the game. The rest of the Cougars defense didn't do too well, either, giving up 192 yards and four touchdowns to Huskies running back Myles Gaskin. 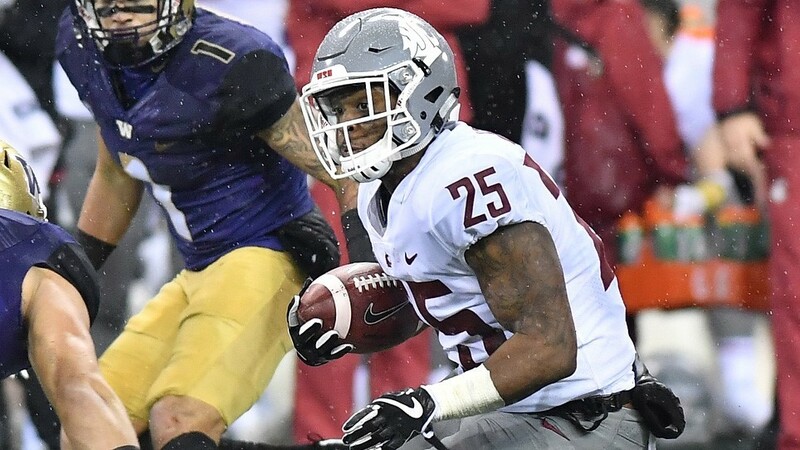 The 2017 Apple Cup marks five wins in a row for the Huskies, and the Cougs have given up at least 40 points in each of the last three, while their offense has been exceedingly meek in the face of the UW defense. Hard to see how things will get better for the Cougs in this series. If they can't hang in a year they have an outstanding defense and record-setting quarterback, why would we think things will improve? The loss lands the Cougs in third place in the Pac-12 North for the season and sends Stanford to the conference championship game. Up next for the Cougars: Waiting to see what bowl game they get, and whether alleged "genius" coach Mike Leach gets poached by another program. After Saturday, a few more Coug fans might be okay with that. Idaho's chances of making a bowl game in their last year in the Sun Belt Conference were already gone before they played New Mexico State on Saturday, so give the Vandals credit for hanging tough and only losing 17-10, despite being outgained by nearly 200 yards. Two turnovers in the game's first six minutes killed the Vandals when the Aggies turned them into a 14-0 lead. The Vandals close their season Saturday with a game at Georgia State. THANK GOD FOR THE NFL? You probably haven't heard many people saying that lately, and the ratings are lagging this season, but with a major pause in college football until bowl season arrives, the Seahawks are all we got around here. On Sunday, Seattle hung in the playoff and division race by plodding their way to a 24-13 win on the road against 1-10 San Francisco. The Seahawks now stand at 7-4 overall, a game behind the division-leading Rams, after Russell Wilson threw for two touchdowns and ran for a third. Up next for the Seahakws is a nationally televised home game against the hottest team in the NFC, the Philadelphia Eagles. The game is Sunday at 5:30 pm on NBC.